This entry was posted in Web links on January 29, 2006 by Links. Another day for disc golf and this time at the Lutherin Church. This time I came an hour early to practice after eating at Marsala Wok. We still had problems with trees. Here Jon retreives John’s disc. Unfortunately, Jon would later throw a shot that went really high in a tree. And it was also unrecoverable since there were too many thorny vines to allow Jon to climb the tree. However the day was not all bad. For the first round, the teams were tied. John and Rehana versus Adam, Jon, and myself. So we went another round with the same trees. This time, at a long putt to hole 7, I was able to sink it. And then on hole 9, John was not able to sink a long putt to tie the game and I was able to sink our putt for the win!. 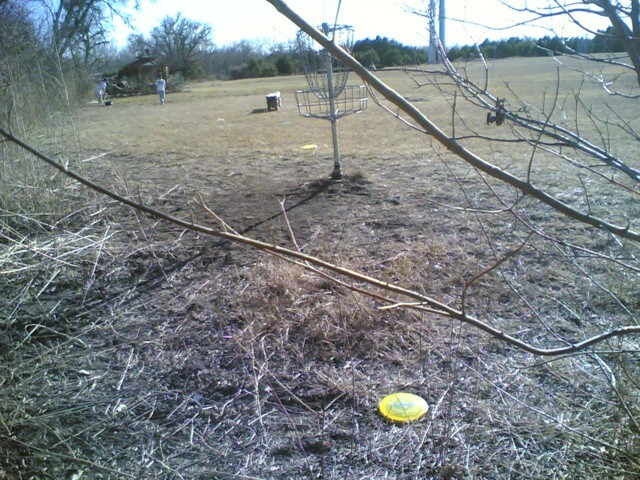 For the third round, I had some nice throws for holes 2 and 3. They landed close enough to putt for a birdie. 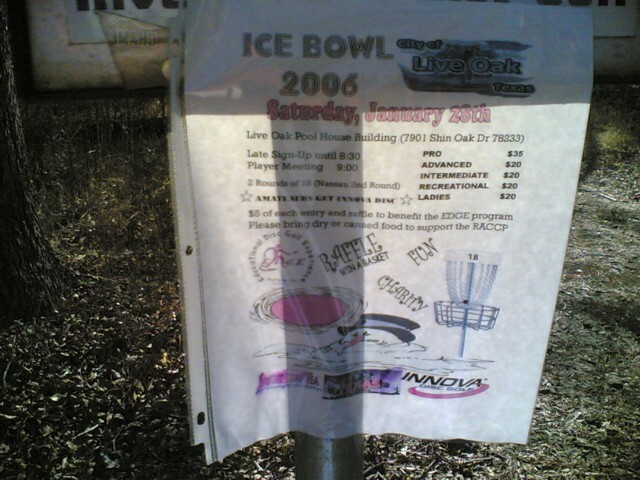 This entry was posted in Disc Golf on January 29, 2006 by Mark. Jon had to work late tonight (It must have been important since tonight is his favorite night of the week). So, we started a game of Tichu and we would stop when Jon showed up. I notice that I don’t call Tichu enough. And Mike commented that if your Tichu made percentage is 100%, then you are not calling enough. So, call Tichu I did. Hopefully, John is getting more comfortable with this game. After all, we did have three one-twos. Now, as a homework assignment, he needs to call Tichu and make it. 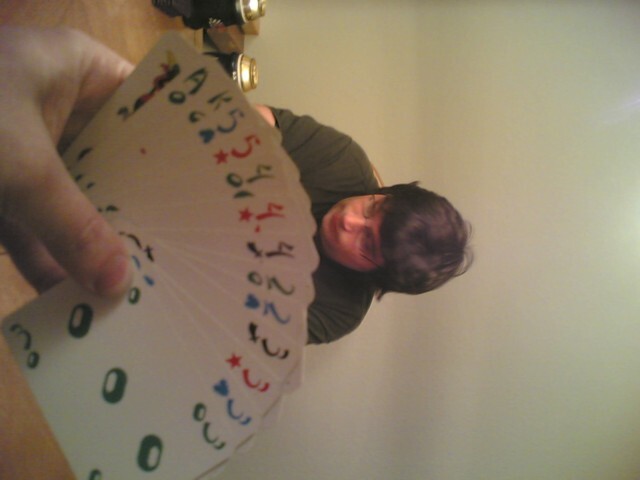 The first picture was my first Tichu hand (a Queen is hidden). The second picture is a dilema. Do you call Grand Tichu on that? Well I called Tichu on it after the pass. 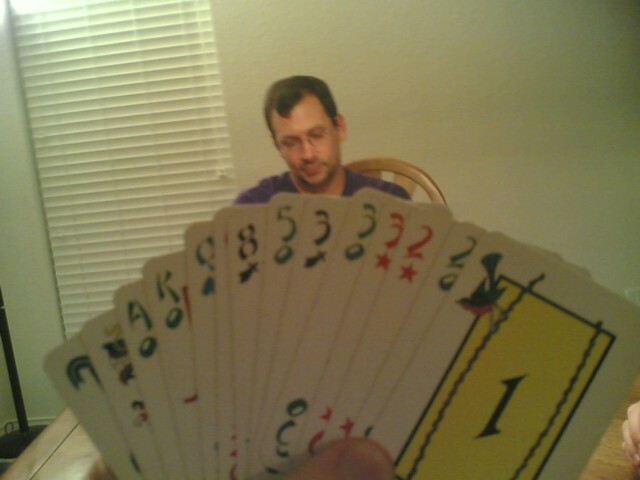 And the third picture is Mike’s over-Tichu call on that same hand. The second game was another new one for me. 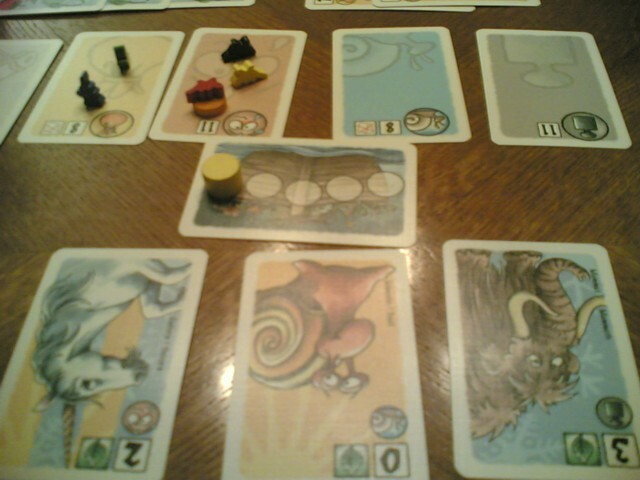 This is an area control game with rather cute animals. The only problem with it is that players do not immediately see correct plays that they can do. It takes a litttle searching and thinking before making a make. Which turns this supposed 45 minute game into a longer game. Still, with experienced player, this game would play better and fit its intended category as a cute filler game. Ahh, another meaty game for me and another one that I wanted to play. Could you tell that a game order of mine arrived? 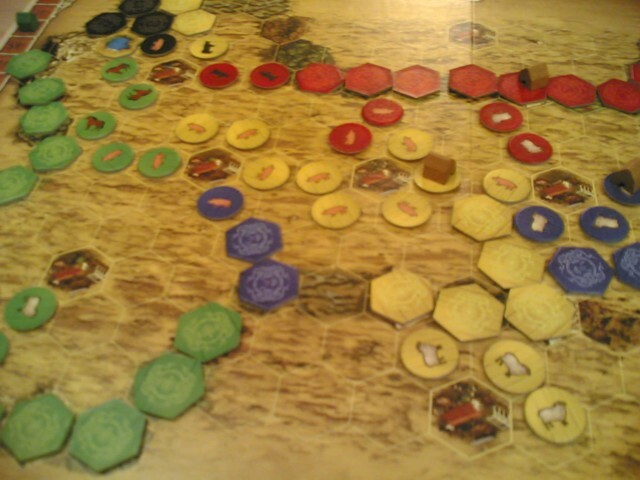 (Along with Caylus and Mesopotamia). However, you do need to know how to start this game off correctly. Of course, I started incorrectly and lost the game because of it. Still one that I want to play more of. This entry was posted in Gaming on January 26, 2006 by Mark. This entry was posted in Lunch Time Tichuers on January 24, 2006 by Mark. Another playing of this game and getting to the burned out point… Yes, its somewhat light and quick. Yes, it can handle up to 6 people. But there are many games in that category. Give the others a chance too. This was my first game where I was hosed by multiple people. Like four people even. Sigh… Nothing much you can do in that situation. Everyone kept blocking off avenues of escape for me. The next game was in the meaty category for me. 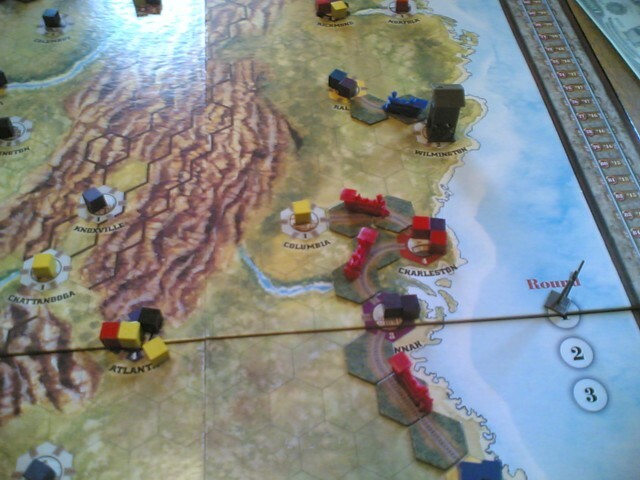 Age of Steam is a game that I would probably like if I played it. However, there is an AOS-savant in our group. And playing with that person means that you play for second place at best. And then there’s this whole thing about how tough the financial model and how easy it is to become broke. So when I could play RT with an easier group (<duck>Ed being the easiest</duck>), I decided to try it out. And the financial model is much easier. Two of the people in our game were taking out massive loans in my opinion. The board is much bigger also so you don’t have to fight with other people so much (but there is less of a choice of rail connections. Much to my dissapointment when I needed to make a connection to Boston but couldn’t). The only problem with this game is there are special cards which come out randomly. So if you can fufill it easily, you score points but if not, then someone else does. Ah, another game that I wanted to play. 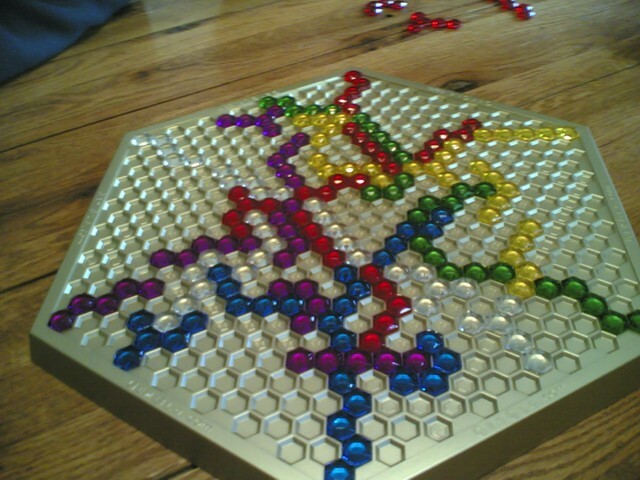 However, we messed up the rules to this game. 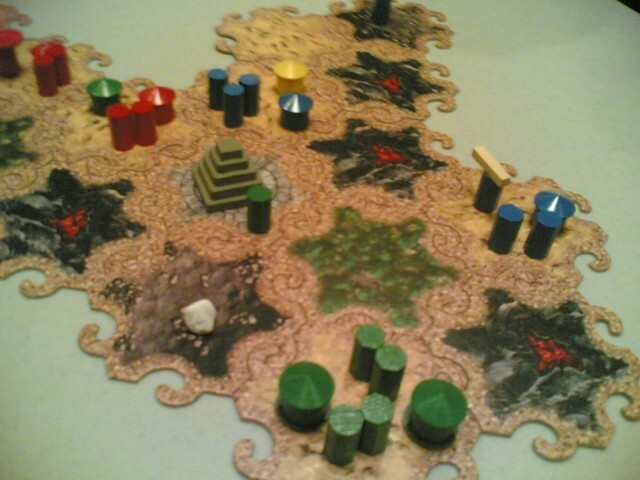 This turned the game into one where you don’t want to build cities and where you want to get ownership of the special tiles that score for you when others build cities. Which is what I did. And when people built cities, I would score 25%-75% of what they did. I am sure that the correct rules would turn this game into something much different. So this playing doesn’t count much. Ahh, I like this game. Either you get lucky or you don’t. And this time I was very lucky indeed. 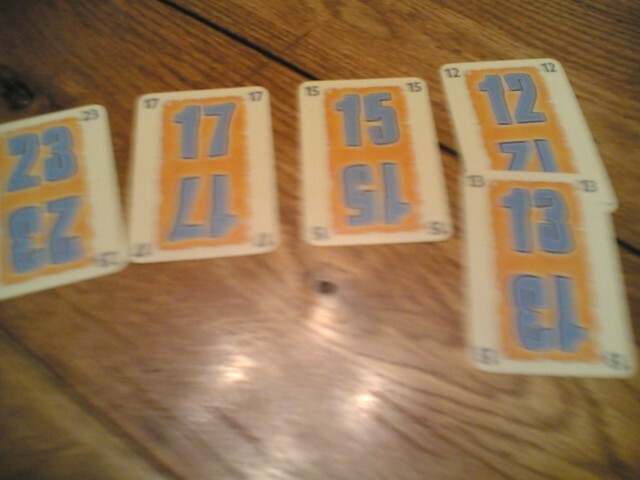 The second to last card turned out to be the 14 which I desperately needed to fill in the missing gap. Another game that I wanted to play. In this game, I was desperately searching for rocks. You see, you need them to increase your manna. And you need your manna to be at the maximum in order to win the game. Gods demand high-level sacrifices after all. It was only at the end of the game, when I found the needed rocks. 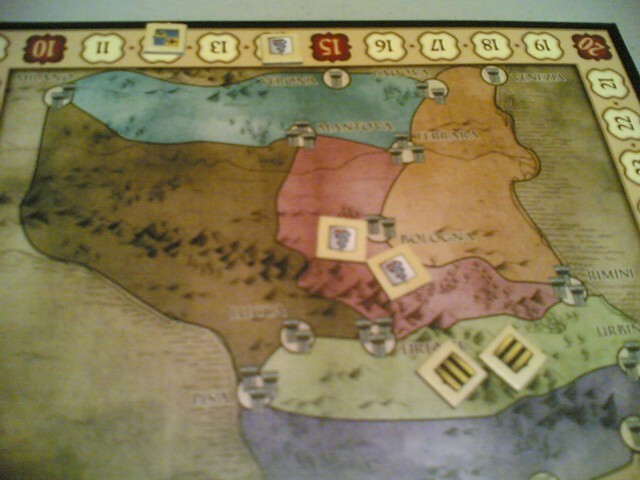 But by then, Ed and Susan were one turn away from winning the game. This entry was posted in Gaming on January 21, 2006 by Mark. Another day of disc golf. This time we went to the Rivery in Georgetown since we were making a trip up north for gaming. The teams were Jon and myself versus John and Mike. And our team started off poorly with 2 shots behind! 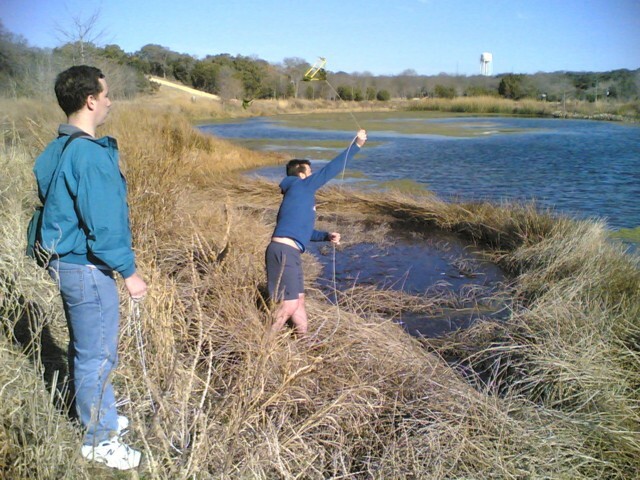 Jon pulled a move of mine and launched his disc 90 degrees off its intended course and straight into a pond. 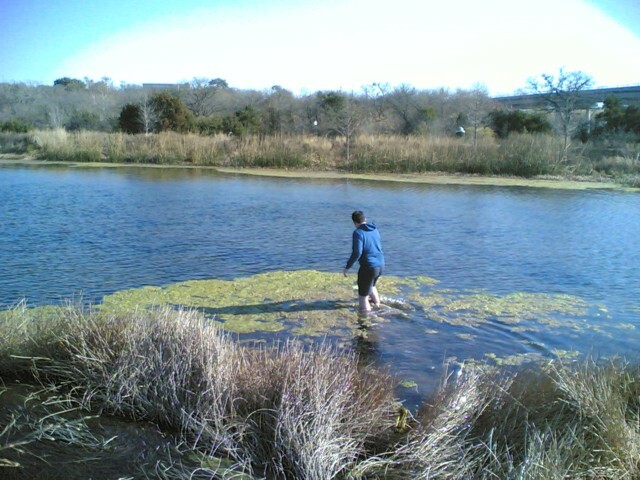 After trying the retreiver and failing because the disc was floating onto of a mat of algae, Jon gave up and walked out to the disc. Another poster for a competitive match. However, given our performance, I don’t think that we are ready yet. John had a really good throw that skipped into the area next to the goal and then skipped into the river. 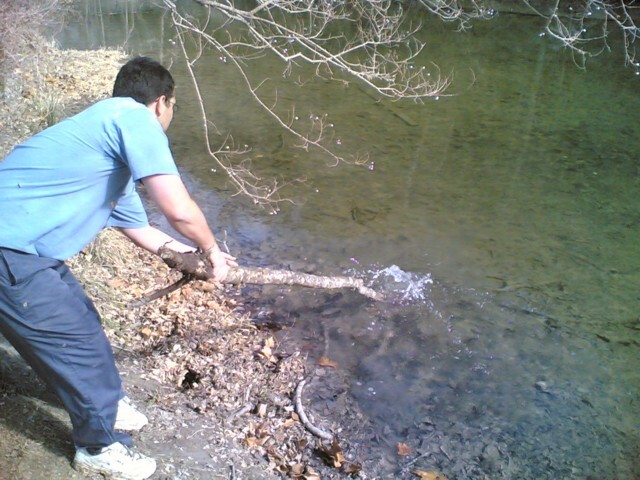 By this time, the retreiver was too tangled to use, so he used the low tech method of a big stick. And now its my turn to get into trouble. I was using my putter (Champion Aero) on this course because it flies pretty straight (well, when I can thow it decently). And since it is light, it has a tendency to remain stuck high in a tree rather than falling down. 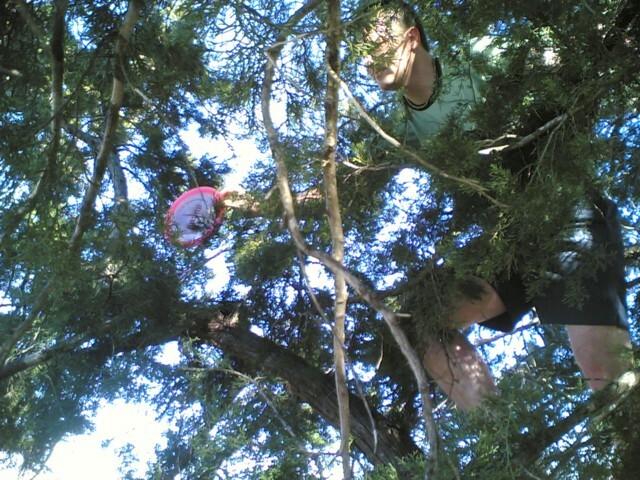 So Jon steps up to the plate and rescues my disc. Which brings us to my first term for Disc Golf. And that is Treejected: tr. 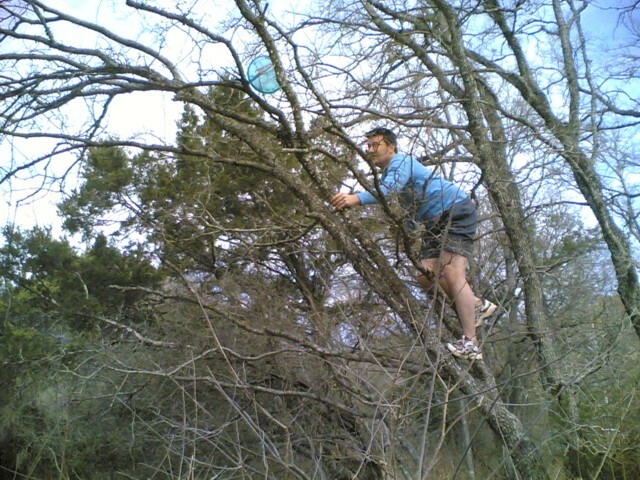 v., having a throw bounce off of a tree and stop or go wildly off the intended course. 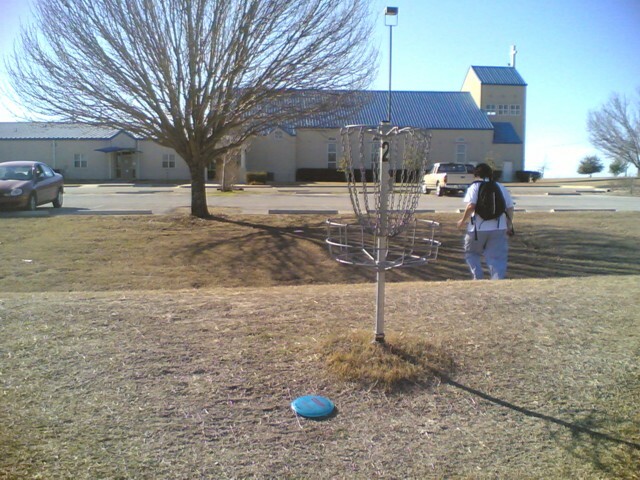 This entry was posted in Disc Golf on January 21, 2006 by Mark. Ed brought a new game for us to play with the theme of penguins trying to collect the most fish. You have two penguins on an iceberg that is littered with fish. On your turn, you move a penguin in one of the six directions for as long as you want up to another penguin or the last hex. And your goal is to stake out territory for yourself that only you can collect. I was concentrating on staking out an area with one of my penguins while letting the other languish. However, luckily for me, the other players left an area for that one. So I was able to create two small icebergs that only I could collect. 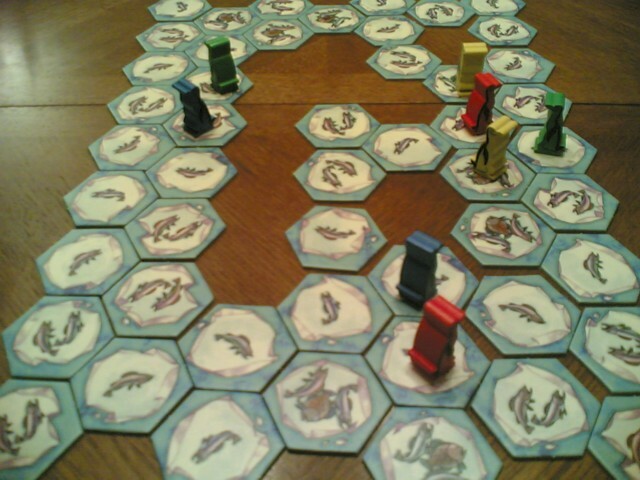 But I couldn’t collect enough fishes for the win. Jon was able to create a bigger space for himself. Another playing of this game for me. It seems to be the popular choice for a filler game for up to six people. 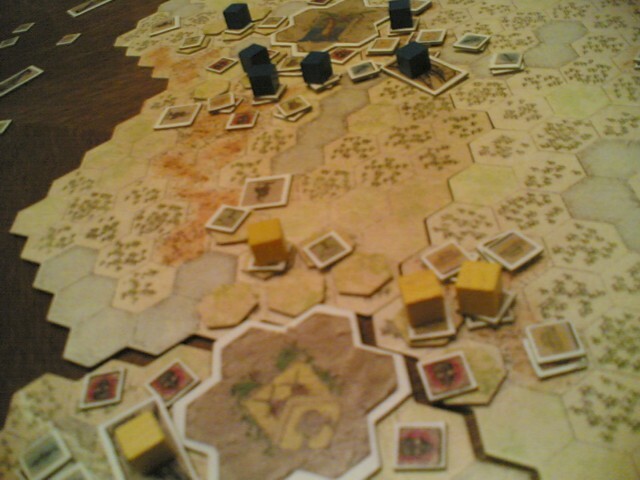 Ahh, another playing of Antiquity for me. And I still haven’t won yet. But I want to play it more so I can master this game! 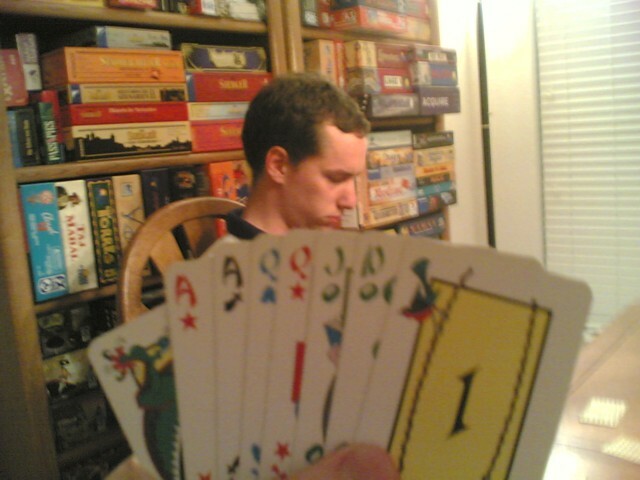 The game can play quickly if every player is experienced with the rules. The only problem is that there are a lot of bits for this game. 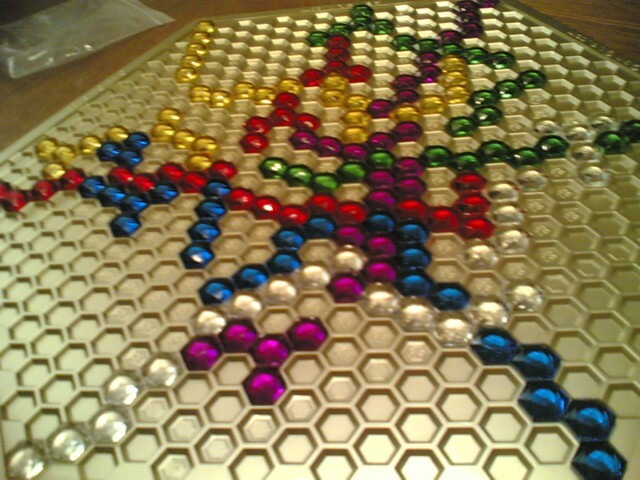 You must set up the board, move bits around during play, and then clean up a whole hell of a lot of games at the end. This entry was posted in Gaming on January 19, 2006 by Mark. This entry was posted in Web links on January 15, 2006 by Links. After getting home last night, I stopped to pick up mail. 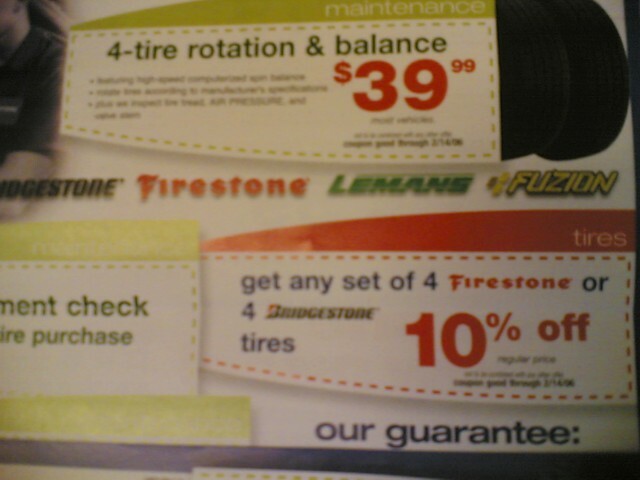 And as coincidence would have it, I recieve an advertisement for a Firestone special in the mail. So, I head over there Sunday morning and see if they can set me up. I learn that they don’t carry them in stock. I then drive over to NTB and learn the same thing. Defeated, I drive back home. The next step is to plug my tire. But when I walk back into the garage I notice another flat tire! Gah!!! I was able to plug the first tire. So I install it and then remove the 2nd tire. But when I plugged that one, it would not hold air. Sigh. So now I am forced to use the spare. I need new tires anyways. I am running low on tread. So I will call a tire place and have them order the tires for me. And have the tires aligned as well. Since I notice an abnormal wear pattern on the second tire. This entry was posted in Interesting on January 15, 2006 by Mark. I was a little worried leaving my flat tire in the bed of the pickup truck at night in the UT area. But I hoped for the best and went off into the night. It was pretty crowded there! 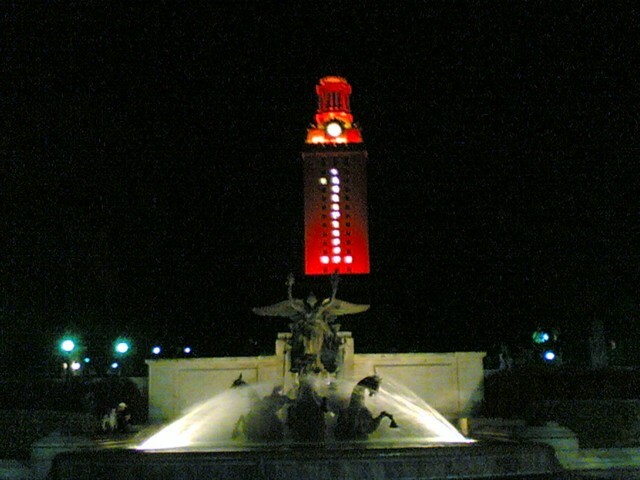 I think every Austinite felt the need to take pictures tonight. I went tonight because there was going to be a celebration tomorrow night and I thought that it was going to be a freaking mad house. Most of the people were by the fountain facing north towards the tower. So I wandered off to see what the west facing view would be like. And there were only a handfull of people around taking pictures. Much more reasonable. This entry was posted in Interesting on January 14, 2006 by Mark.